Expansion in the mining sector — which includes oil and gas development — was the driving force behind U.S. economic growth in the second quarter of 2017, new data from the Bureau of Economic Analysis (BEA) shows. BEA found that mining contributed to growth in all but one state in Q2 2017, led by increased oil and natural gas production nationwide. 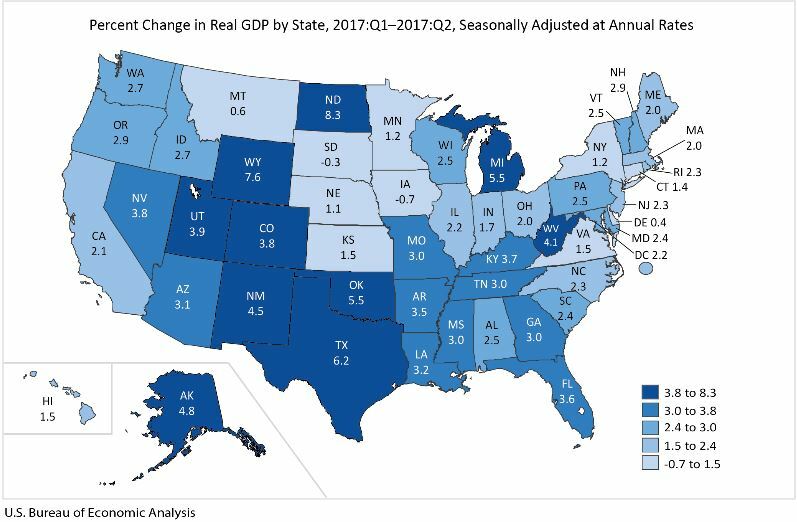 In fact, mining propelled North Dakota, Wyoming and Texas to experience the top three largest gross domestic product (GDP) increases in the second quarter. This growth was significantly greater than growth in other major sectors, such as health care and social assistance (4.7 percent); professional, scientific, and technical services (5.1 percent); retail trade (5.6 percent); and information services (7.0 percent). Overall, the United States experienced a 2.8 percent growth in real GDP from Q1 to Q2 2017, with mining contributing about 0.42 percent growth to U.S. GDP, or about 15 percent of the overall increase. Oil and natural gas production’s impact on state GDP growth is even more impressive. BEA data shows that North Dakota’s economy expanded by 8.3 percent in Q2 – the largest increase nationwide – driven by a nearly seven percent jump in mining. To put this in perspective, the next largest growth by sector in North Dakota during this period was from transportation and warehousing at 0.48 percent. Other states experienced similar growth thanks to oil and natural gas, such as Wyoming, Oklahoma and Texas, where mining expanded by 6.64 percent, 3.79 percent and 2.58 percent respectively. This is a large departure from 7.6 percent contraction felt by the North Dakota economy in the second quarter of 2016, and is indicative of just how economically impactful oil and natural gas development can be. This data also comes on the heels of news that North Dakota’s director of the state’s Department of Mineral Resources, Lynn Helms, expects the state’s Bakken Shale to see 10 percent growth in oil and gas activity in 2018. Meanwhile, growth in oil and natural gas development is positioning the United States to become the “undisputed leader” of global oil and natural gas markets, according to the International Energy Agency. It’s hard to deny the economic benefits of oil and natural gas development, with this latest BEA data reinforcing just how vital production is for state economies.